A simulation lab at the UH-Manoa's School of Nursing and Dental Hygiene lets nursing students work with a simulated adult and baby in a hospital setting to get a better hands-on experience. 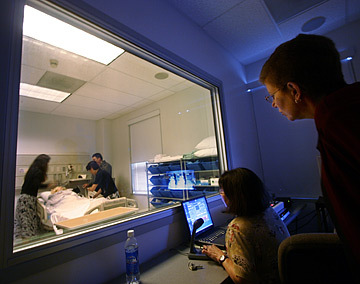 Various medical emergencies can be simulated by the mannequins, which are remotely controlled from an adjacent room. Faculty members can observe students through a one-way window in the control room or on a video screen in an observation room. » Shortage of educators plagues isle nursing schools. HEARING SimMan wheeze and cough and seeing his chest rise, it is easy to forget it is not a real hospital room with a real patient. "Can you cough for me?" Lorrie Wong asks SimMan, a medical training mannequin converted to "Blondie," a female patient with a blond wig, for this demonstration. "It sounds like a lot of mucus in there. We can suction it. ... Is there anything coming out? Oooh, we've got a big block of mucus there." The UH-Manoa College of Nursing and Dental Hygiene has had SimMan for about a year and recently acquired SimBaby with funding from the HMSA Foundation. The mannequins cost about $40,000 each and have similar capabilities, Wong said. Wong is director of simulation at the college, and Ginny Date is the simulator learning lab coordinator. And SimMan is the star of the show. SimMan has interchangeable body parts and can be transformed into a woman. He can "speak" through the instructor microphone. He can moan, vomit and make a variety of distress sounds, as does SimBaby. He can have fake tattoos, black toes for gangrene and abdominal wounds, and his arms and legs can be amputated if needed for a teaching scenario. "We try to keep this looking like a hospital room," Wong said. "Students catch on real fast. They just love it. They forget they're in a simulator and get into it." The lab is fully equipped so students can quickly respond to any condition programmed for the patient. They can give intravenous medication; feel pulses; listen to bowel, heart and lung sounds; take blood pressure; administer cardiopulmonary resuscitation; and use an automated external defibrillator. "The baby has a blue mouth when it's not breathing well," Wong said. "Its fontanel (soft spot in the head) bulges when it's not well." It can cry or make contented sounds, she added. The lab also would like to purchase Noelle, a birthing mother simulator. "It's not as sophisticated as SimMan, but she will give birth," Wong said. "It's an excellent tool for teaching students. We can mock emergencies. ... It's all about safety and helping our students do a critical-thinking process." The mannequins are controlled remotely from an adjacent room that students cannot see from the hospital room. Faculty members can observe the students through a one-way window in the control room or on a video screen in an observation room. "Students come in and talk to the patient, and I can answer on a microphone so the answers are pertinent, real answers to the questions," Wong said. "Things go wrong," she said, noting for example a patient with pneumonia in respiratory distress. "We can ... make the heart stop," requiring students to resuscitate the patient, she said. 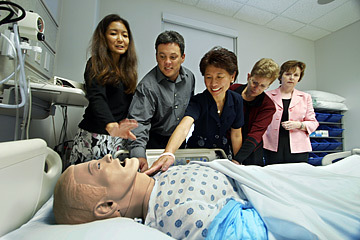 Lorrie Wong, director of simulation at the School of Nursing and Dental Hygiene, left, demonstrated feeling the pulse of SimMan for Mark Forman, executive administrator for the HMSA Foundation; Sai Chantavy, executive director of the Maunalani Nursing and Rehabilitation Center; Denise Bilodeau, administrator at Hi'olani Care Center at Kahala Nui; and Mary Boland, dean of the School of Nursing. The lab would like to purchase a birthing mother simulator to expand its resources. "I think having the simulator saves lives. It prevents errors and improves safety in the hospital," Wong said. Sometimes the students do not save a patient, which is also good, she said, "because they have to learn about death and dying and talking to families." Students learn culturally appropriate ways to deal with families, working with faculty members who pretend to be family. The simulator lab "is like doing reality TV," said Mary Boland, dean of the School of Nursing and Dental Hygiene. "It's fun. It engages the kids." Before, she said, "we were trying to tell students what to do, but we were never able to engage their senses." Wong said five courses will use the simulator lab in the fall, giving students practice with the mannequins about 16 hours per semester. Boland wants to expand use of the simulator laboratory to 10 hours a day, including weekends, and make it available to hospitals for staff retraining. "It's a tremendous way to look at issues regarding patient safety," she said. "We view this as a resource to the community." Boland wants to reconstruct the school's old 12,000-square-foot training laboratory and add simulators, computer software and specialized staff for different training settings, from acute care to long-term care. It would also be available to hospitals and home care agencies for training, she said. She said the estimated $2 million project probably would have to be done with a private partner. The school also is trying to raise funds and will hold a fundraising gala Oct. 21 at the Hawaii Prince Hotel in Waikiki to celebrate 50 years of nursing at UH-Manoa.